As is mandatory with all reviews, let us acknowledge the tremendous impact of the original Blair Witch Project, a full-borne cultural event that tapped into the zeitgeist. It was a rare indie movie that curated a must-see reputation and became a blockbuster. The found footage format was highly influential afterwards as were its low-fi thrills, community interactivity, viral marketing, and experimental construction. I remember having heated arguments with people about whether the movie was indeed real or a work of fiction. I pointed to the TV once and said, “Look, the actors are promoting it on MTV.” Naturally imitators followed suit and the studio looked to eagerly turn a curiosity into a franchise. 2000’s hasty sequel Book of Shadows was quickly rejected and just as quickly the Blair Witch phenomenon had slipped away. It remained dead until this summer. 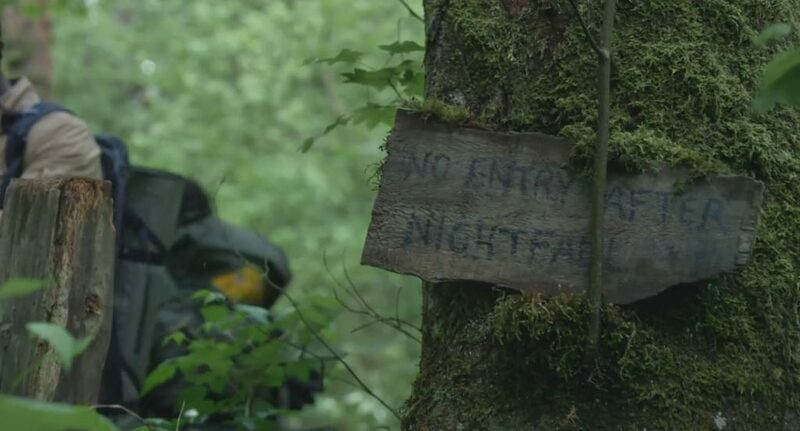 Director Adam Wingard (You’re Next, The Guest) and frequent screenwriting partner Simon Barrett had recently made a horror movie called The Woods, but at 2016’s Comicon the secrecy was finally dropped. It was a sequel to The Blair Witch Project, filmed in secret J.J. Abrams-style. It was a stunt that worked, and once again there was life in this franchise. 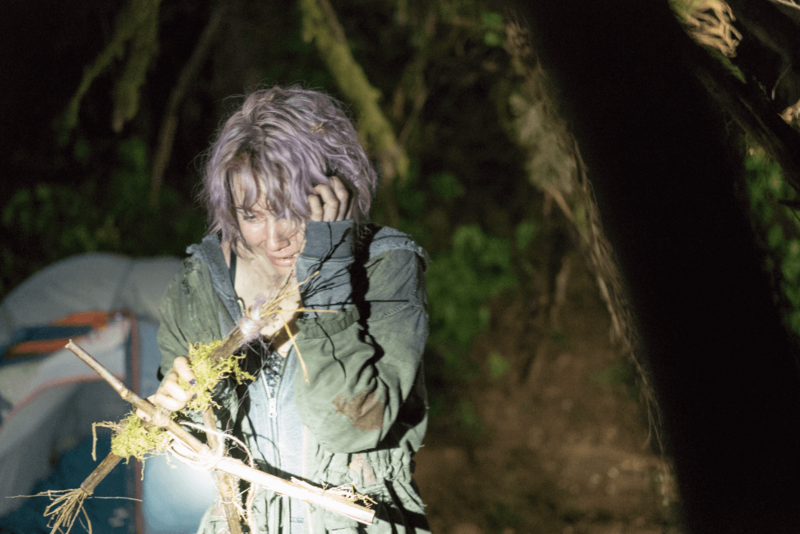 This will only last until people see the new Blair Witch, a monotonous, confused jump-scare haven that’s too indebted to the original and discards anything interesting it stumbles onto. Sixteen years after three backpackers went missing, footage has been posted that possibly shows one of these backpackers, Heather, still alive. James (James Allen McCune) is now an adult male and determined to find out if his sister is alive. Lisa (Callie Hernandez), a film student and maybe James girlfriend, tags along to record James’ hunt for the truth into her graduate thesis. Their friends (Corbin Reid, Brandon Scott) come along for the adventure into the woods, as well as a conspiracy couple (Wes Robinson, Valorie Curry) responsible for posting that new footage. The conspiracy couple leads them into the woods and it isn’t long before people get lost, tempers get heated, and strange disturbing noises materialize from the never-ending night. Calling attention to the annoying trait doesn’t make it better. The sound design is also, in a word, amplified. It sounds like Bigfoot or a dinosaur is tearing through the woods and wreaking havoc. It was enough that I hoped the movie would just reveal the Blair Witch never existed and instead it was some other sizeable monster of legend. I’ll give Wingard credit for the found footage cinematography not being self-consciously overdone. The characters have an incredible stash of cameras, from GoPros to flying drone cameras, which makes the editing less choppy and the movie easier to watch. There are exactly two scenes that unnerved me. One is the sheer numbers of an expected item upon waking up, the immense quantity and variation in size providing an eerie sight as it fills the screen. The other is a late sequence that involves squeezing in a tight space, which allows Wingard to employ some nice claustrophobic tension. Short of these two moments, and they are mere moments, the movie was boring me so profoundly that I considered just leaving, and I’ve never walked out on a movie before. It felt like it was going nowhere fast with characters I didn’t care about and without any relevant suspense. 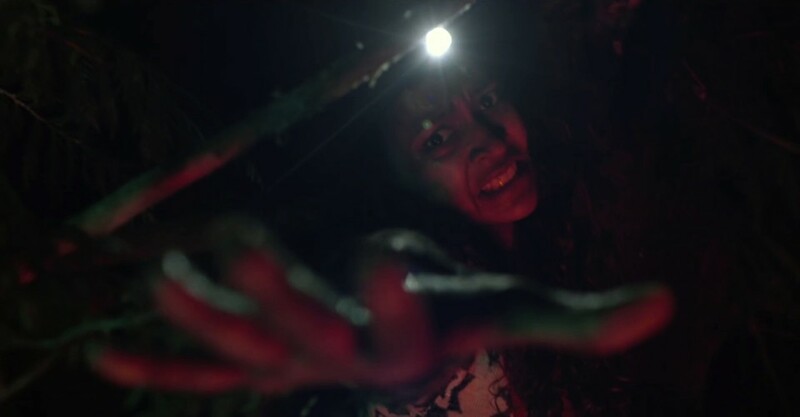 The found footage filming elements are even used to enhance the jump scares with sudden visual and sound glitches amplifying the tired attempts to constantly startle its audience. This is a movie more concerned with startling its audience than scaring it. When the movie does start to tantalize your interest, it’s like a mirage that soon vanishes and you’re once again left in your dire predicament. Getting lost in the woods is not interesting minus interesting aspects. However, finding out that time is operating at a different level, now that’s interesting. The characters set their alarms for seven A.M. but it’s still dark out. The possibility of the Blair Witch manipulating time to trap hikers was the first moment in this entire movie that made me sit up in my chair. It took the movie in a different direction that demanded my attention, and it opened up the possibilities of what had been a rather lifeless enterprise up that point. Show me this movie. Alas, it’s an aspect that is quickly shoved aside and largely forgotten even with the timeline of events regarding the footage. There’s a scene where the stick figures directly communicate a powerful connective relationship, and yet this too is never touched upon again. There’s a new threat introduced that takes the movie in a body horror direction and raises questions about whether the woods themselves can become alive. It’s another intriguing moment that culminates in what promises to be a memorable gross-out image, and instead it too peters out and then unwisely abandons the body horror angle. It’s almost like the movie is so single-minded in its path that it ignores the intriguing and preferable detours. 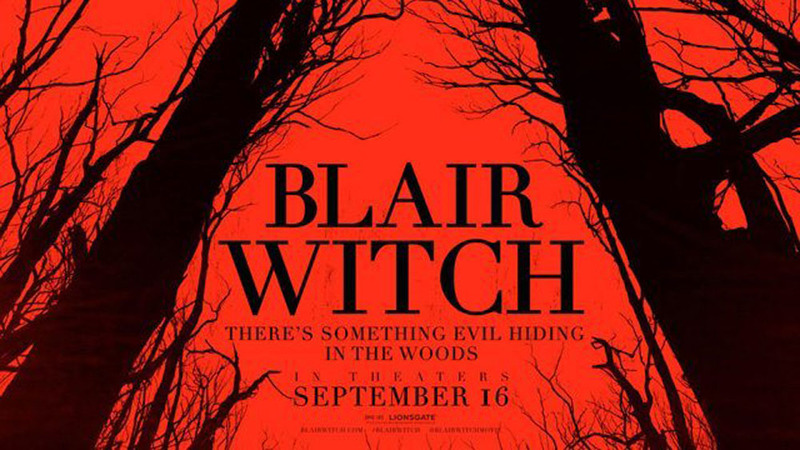 Wingard and Barrett are trying to expand the Blair Witch mythology but their reboot operates on the assumption that there is even a base to work upon and that its audience is familiar with heretofore unspoken rules that appear arbitrarily and randomly. This reboot operates in a world that acknowledges the release of the first Blair Witch movie, yet nobody seems to be any different from this. Obviously James is different having to lie with the legacy of the movie, but why venture out into the woods on a whim of hope to find his long-lost sister who vanished 16 years ago? Does he think she’s just been living off squirrels and twigs in the ensuing time? Why doesn’t James try and question who edited the footage from his sister into a narrative? Why doesn’t he try suing the film production for profiting off his family pain? Why hasn’t Burkitsville, Maryland become a counter-culture tourist destination from taking ownership over its supernatural legend, much like Salem or Roswell? The town should be swamped with adventurous backpackers who want to live the experience. The much maligned Book of Shadows did far more to discuss the reality of the Blair Witch phenomenon and the tenuous hold on reality that the Internet age was ushering in. Wingard’s version eschews this world-building context for narrative immediacy. James wants to find his sister, he gets a clue that she might be out in those woods still, so they all go into the woods. Once the conspiracy theory couple insert themselves onto the trip it seems odd that we’ve ignored the larger context of the legend, instead rehashing how the Blair Witch died. As things begin to fall apart in the second half, the events start to feel arbitrary and poorly defined. There’s a sequence during the climax that I’ll try my best to describe with some discretion but be warned, folks (spoilers): the remaining characters eventually find that same shack in the middle of the woods, though the exact number of floors seems unclear. The witch looks to finally confront our characters, though why she/it waited until this moment is also unclear since she/it seems to be entirely overpowering. That’s when a character declares, with no prior guesswork to arrive at this conclusion, that they have to stand in corners and as long as they don’t turn around and look they will survive. And this works. It’s not explained why this Raiders of the Lost Ark closed-eyes routine is somehow the secret to supernatural survival (ignorance is bliss?). When the character unleashes this tidbit it’s treated like the audience knows the rules of the Blair Witch universe, and we sure don’t. At no point has a larger system been established, so when characters start spouting rules it feels like the movie is making it up as it goes. This don’t-look-back trick is played out almost to a comical effect, which culminates in the rising question of whether a character is going to backwards walk out of the whole stupid forest. The muddled world building (time dilation, voodoo sticks, tree monsters?) makes it feel like the doomed characters are ultimately trapped in a half-finished screenplay. I was honestly expecting more from Wingard and Barrett after their previous genre collaborations. These guys know the underpinnings of enjoyable genre filmmaking and how and when to upend the conventions and expectations, zigging when others would zag. I felt these two would be able to take a studio gig like Blair Witch and find something new, something interesting, and certainly something scary with the property. I regret to say that this Blair Witch might be new but it sure fails to be interesting or scary. The characters are meaningless and interchangeable and boring. Their decisions are often illogical and stupid. The scares are stacked too high in favor of cheap jump scares, and the movie lacks the patience to develop its tension and horror. It can’t even properly establish rules for the audience to follow. It’s like the filmmakers are being upfront with their lack of faith in their final product. I think the key missing ingredient is, surprisingly, humor. Both You’re Next and The Guest balance along a delicate tonal line that can veer into macabre comedy any moment to lighten or heighten the tension. There are no (intentional) laughs to be had with this retread into the woods. I think the newest Blair Witch has done the unthinkable: it’s redeemed Book of Shadows.